Best wishes this weekend to all teams playing away. Training is on as normal on Tuesday 16th June. Training with Rui is also on Weds 17th June and Thursday 18th June. Training will resume on Tuesday 14th July. U9 Red to wear playing shirts, U9 Blue to wear training shirts. A reminder that there are Football fixtures coming up on the 20th June, 27th June and 11th July. In preparation for this – please can I ask all families to complete this quick online form to determine availability. This is required to determine whether we are able to field teams during the holidays. Please complete this form by 9am Monday 15th June so that arrangements can be made. I will advise whether matches will take place after Monday. 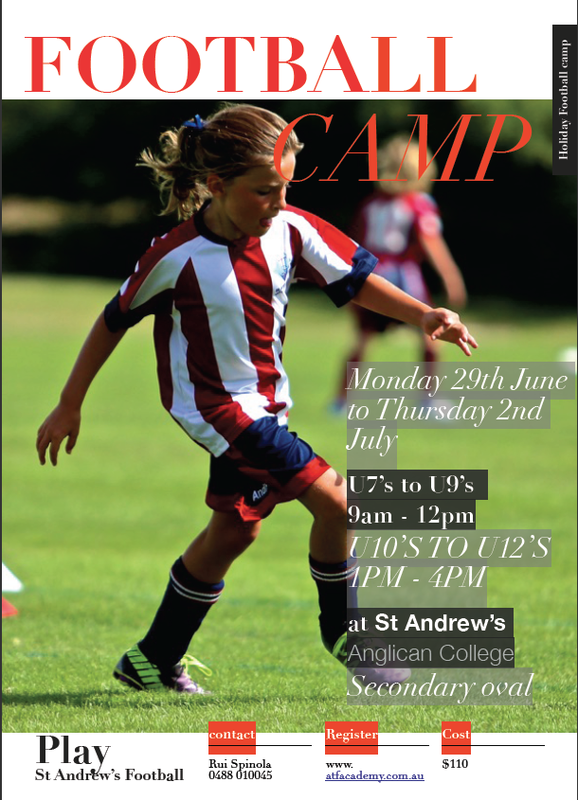 Registrations are also now open for the Holiday Camp here at St Andrew’s from the 29th June – 2nd July. Really looking forward to a great day on Saturday at St Andrew’s. Great to have all our teams at home. A reminder that all players are required to wear St Andrew’s tracksuits and are not to wear any non St Andrew’s uniform items ( this includes non St Andrew’s caps). We are also making a St Andrew’s Football video on Saturday so I look forward to sharing this with you. 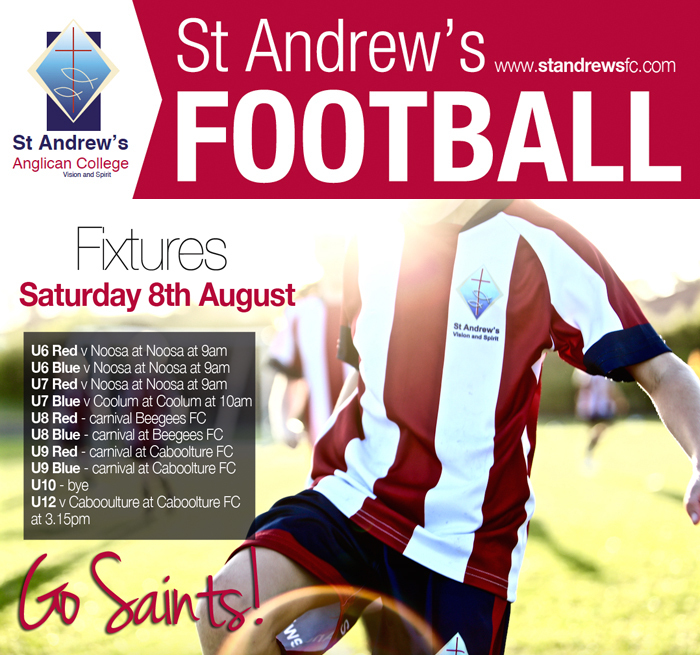 Another super day of St Andrew’s Football. With 8 teams out of 10 going unbeaten. A special mention to our U12 team who are new to Football but have made wonderful progress this season and knocked in a 7-1 win on Saturday. The skills of all our players continue to get better and better and importantly there is lots of enjoyment. The St Andrew’s Football culture is developing into something pretty special. 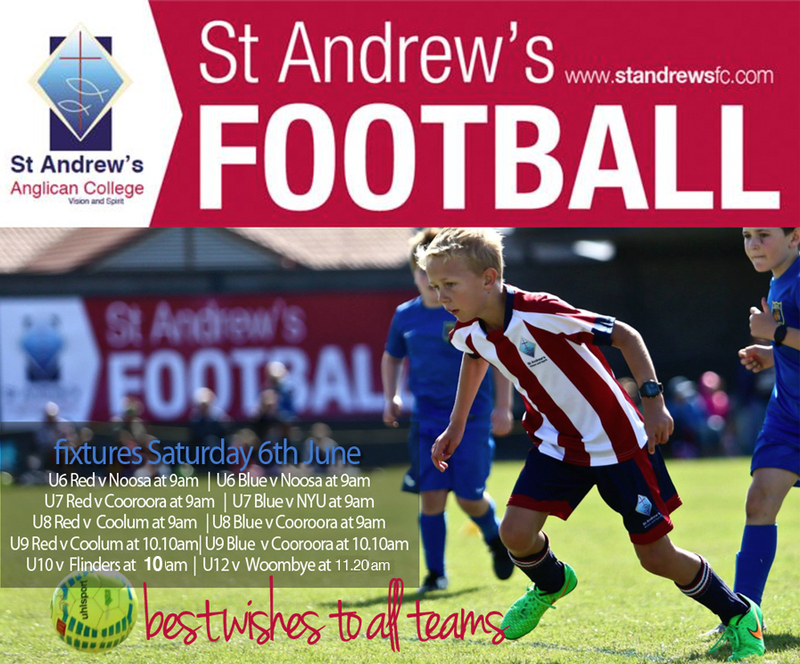 All St Andrew’s Football is off except for U8 Red and U9 Red matches at Noosa which are still on at this stage. The U6 and U7 carnivals have been rescheduled to the 23rd May. Hope you are well and enjoyed a wonderful weekend. 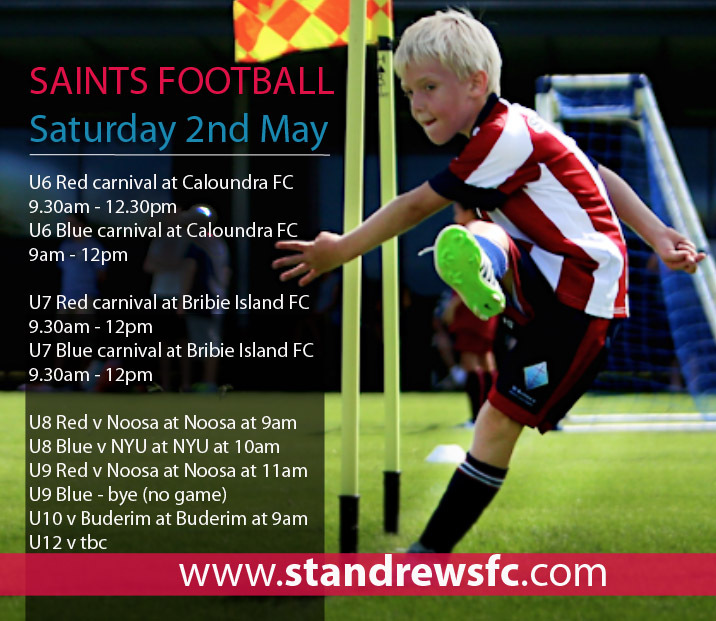 Saints Football is back this Saturday 2nd May. All teams are away. Our U6 and U7 teams will enjoy a morning carnival at Caloundra and Bribie. The U12 match is yet to be confirmed for this week. A great app is the Fox Sports Sporting Pulse app which you can add to your phone and is easy to see your teams fixtures each week. Then you can select your team and it will add to your favourites. Please give $6 to the team coach that is required to be paid before the start of the carnival.